this might be my favorite picture ever. the lighting, the dress, the building, the stairs. i cant even choose my favorite part of it, and i really just want to be there and explore the building. this is so amazing. 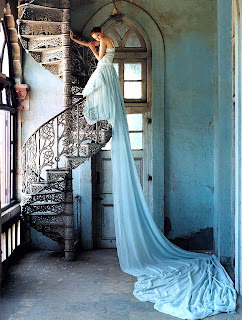 photograph taken by tim walker. I can see why you like the dress so much, it's so ahhh. Words can't describe it, it just makes you want to look at it even more and the scenery gets you thinking as well. thanks for the comments loves!